I’ve been sent the details of this competition, which I think looks loads of fun! I love Sudocrem, it’s a constant feature in our house especially as Emily is prone to outbreaks of sore skin and it really seems to soothe it. Apparently they’ve been going 80 years. Blimey. Have a read and then go and enter (that’s an order!). 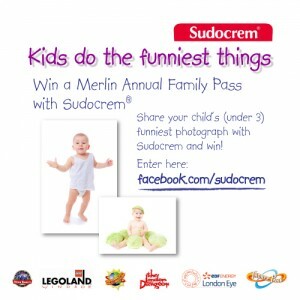 To celebrate the launch of Sudocrem’s shiny new website www.sudocrem.co.uk and informative social media channels, we’re offering a 12 month Merlin Family Pass worth almost £400 to the winning mum or dad who shares with us their child’s (under 3) funniest photograph with the story behind it. Please note submissions must not relate in any way to the use of Sudocrem Antiseptic Healing Cream. 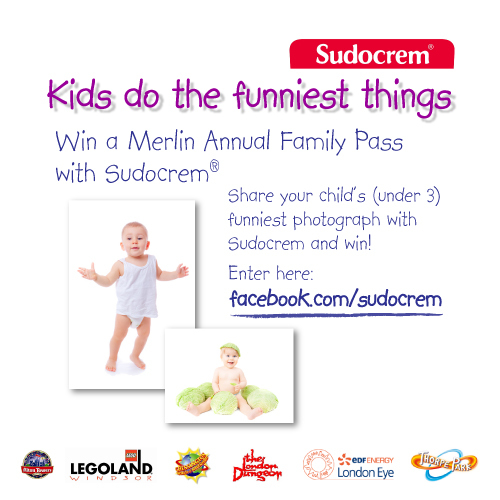 It’s simple – just visit www.facebook.com/sudocrem, ‘like’ the page and share your child’s funniest photograph with the story behind it. If you didn’t already know, Sudocrem’s – Sudocrem Antiseptic Healing Cream is one of the leading baby nappy rash treatments and has recently undertaken a full adoption of social media including Twitter www.twitter.com/sudocrem, Facebook www.facebook.com/sudocrem and a blog www.sudocrem.co.uk/blog, run exclusively by some very experienced mummy bloggers. All the social media channels will be communities breaking new ground and getting to the heart of all matters that are important to parents today.